After I attended the “National Conference on Just Governance: The Nigerian Biosafety Act and GMOs – Implications for Nigerians and Africa” organized by AFJN in collaboration with other Nigerian NGOs in Abuja, May 24−26, 2016, I was moved to action, particularly after listening to the lack of government guidelines and regulations on the introduction of Genetically Modified Organisms (GMO) in Nigeria, as well as the environmental, social and health implications of this way of growing the food. Feeling strongly that no one has the right to colonize the Nigerian food system, I know I have to do something to let the people know what is going on in our country. At the end of the conference, I knew that the people I work with, the Community Self-help Association of the Justice Development and Peace Mission, Oro, Ilorin Diocese, Kwara State Nigeria, should be made aware of the danger ahead of them in relation to the food we consume and the way the food is grown. On July 23, 2016, I held an awareness workshop where fifteen people comprising of farmers and civil servants attended. At the workshop, I shared with the participants what I learned at the Abuja conference: the loopholes in the Nigerian biosaftey laws, the government granting Monsanto a sweeping concession to introduce genetically modified crops in Nigeria and target Nigeria’s major crops, and the overall implications of genetically modified crops for the nation. Mostly, I expressed my fears on the activities of big corporations like Monsanto which is nothing other than the colonization of our nation’s food system. During the workshop, the participants shared their experiences in relation to their fears about GMOs. One of the farmers shared how the crops he had in his farm didn’t do well because of the chemicals he used. He confirmed that some persons gave him and other farmers from his locality the chemicals they used which affected their crops. Another said that the maize (corn) he planted earlier produced a bumper harvest, but the recent ones were diseased. He lamented, “I know that some people are giving out crops and chemicals for farmers to use. I got some, and now my crops are no longer the same.” Further, another participant shared that there was a period in which some farmers brought abnormally large tomatoes to the market. He told them that the tomatoes were GMO because they were bigger than the natural organic tomatoes, but they didn’t listen to him. Others said that Agrochemical agents advised them to use chemicals on their farms. The participants were shocked at the level of government insensitivity, to allow Monsanto and GMOs (and the chemicals that come with them) into the country. They expressed concern that they have consumed or planted some genetically modified produce. 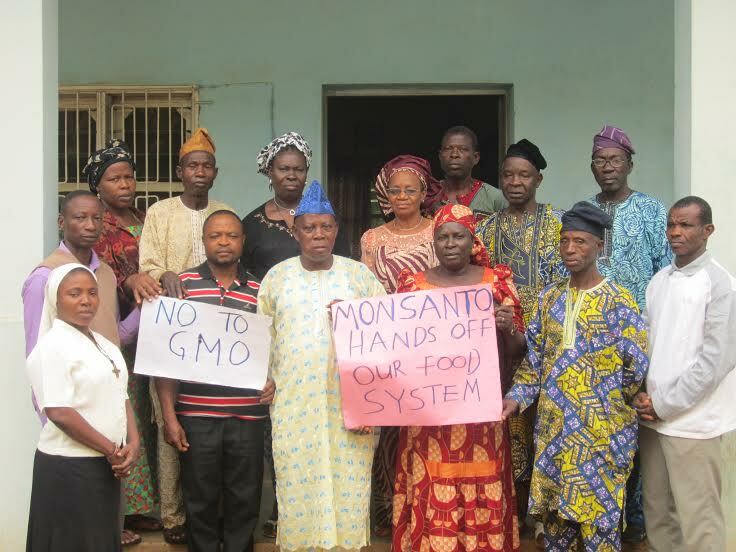 At the end of the workshop, I felt confident that the group saw the danger ahead if GMOs are allowed to take over the Nigerian way of growing the food we eat, which is healthier and more sustainable. I was also delighted that they pledged not to allow anyone control to their food system. They committed themselves to going back to their rural areas and localities to disseminate the information as well as to educate other farmers to be vigilant and not to be deceived by anyone who comes promising bumper harvest by altering their natural way of growing. The participants also pledged to stand against anyone who wants to sell the nation to big corporations and anyone who wants to subject the country to a new form of colonization, one where outsiders control our seed, land and way of growing food.